Malaika is delighted to see her mother again, but after a brief stay in their Caribbean island home, she’s taking Malaika to her new home in Canada, along with her new, white French-Canadian husband, Mr. Frédéric, and his daughter, Adèle. 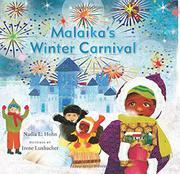 Though her new family is pleasant and welcoming, Malaika’s annoyed with the cold, the layers of puffy clothes she has to wear, the new language she has to learn, and—the last straw—when the family goes to a carnival, there are no bright, beautiful costumes as at Carnival at home (the subject of Malaika’s Costume, 2016). Malaika kicks over Adèle’s snow castle out of frustration. The next day, Malaika and her grandmother have a video chat, which lifts her spirts and reminds her of friends and family, and she decides to give this new home a chance. She starts with an apology to Adèle, who embraces her new sister and teachers her to catch the newly falling snowflakes on her tongue. As in the previous book, Hohn uses Malaika’s lovely patois to tell the story, which teaches Caribbean and French terms as well as focusing on the primary story of coping with a new country and a blended family. Luxbacher’s mixed-media collages are wonderful, vibrant, and expressive, and both the cover and final pages tell the happy ending without a word.